Need a last minute Thanksgiving recipe, or just a great meal to serve to family & friends? Try out this No “Tuna” Chickpea Casserole. There is nothing more cozy and Fall – like to me than a nice warm casserole. With the temperatures dropping it’s all about recipes that come straight out of the oven and into my mouth. I wanted to create my own take on a “tuna” casserole minus the tuna (obviously). Chickpeas are a really popular Tuna replacement in the Vegan world so I knew they would fit perfectly in this recipe. I have created a couple of chickpea “tuna” recipes for my blog, and the funny thing about it all is that I never actually ate tuna before going vegan. I rarely touched fish, and the smell of tuna has always turned me off. However, I am a huge chickpea fan so this just works great for me! 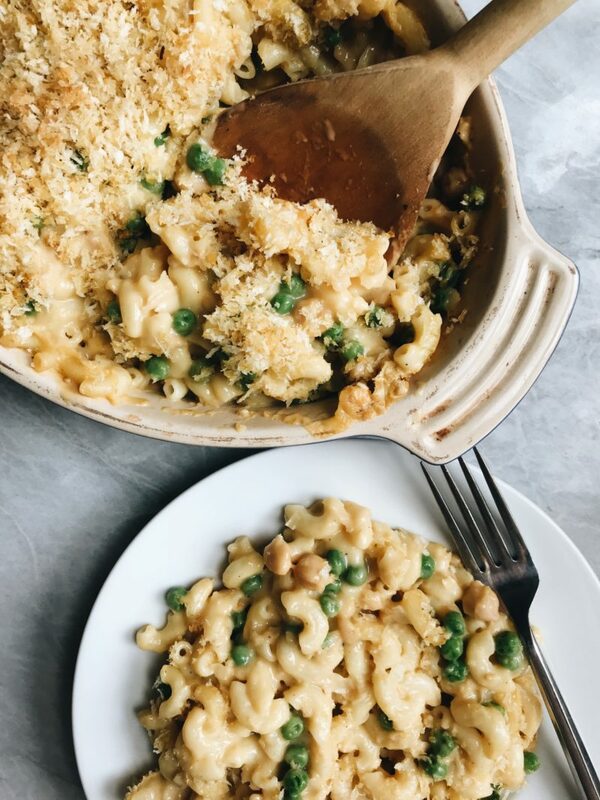 This is a super cheezy recipe and I love the textures between the peas and chickpeas, so I know you will agree that it’s a winner! 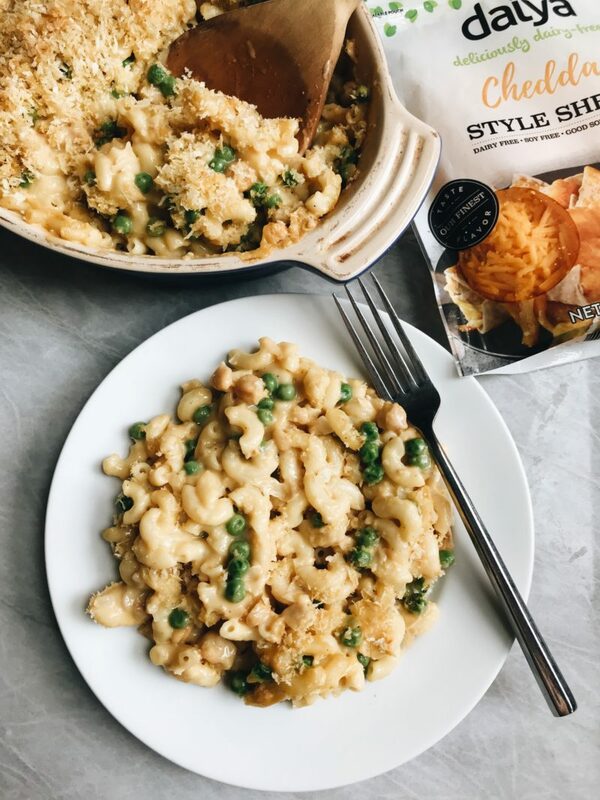 To make this recipe the cheeziest it can be, I used Daiya’s Cutting Board Shreds Cheddar Style. I absolutely love the cutting board style shreds! 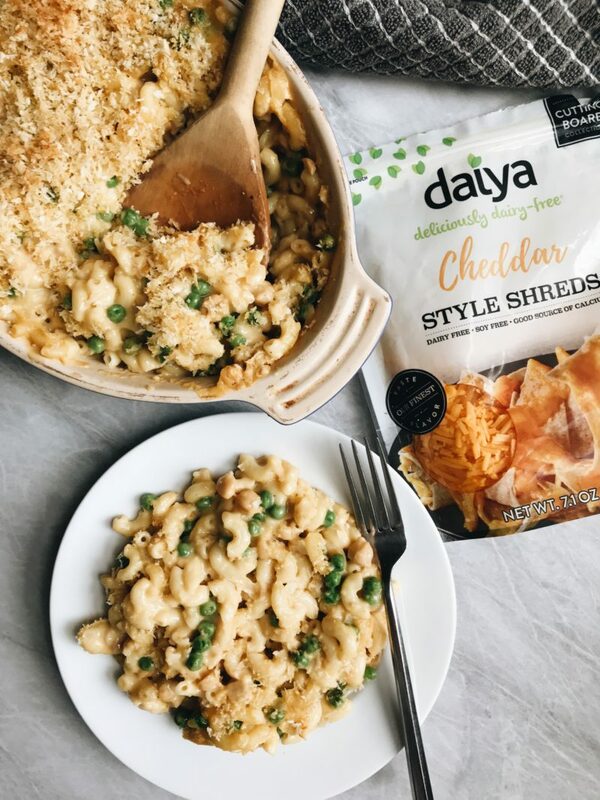 Compared to Daiya’s original shreds, the cutting board shreds have a more dairy-like flavor and and texture. They melt and stretch has also been improved (in my opinion) making it even more fun to enjoy. They’re also available in their other flavors, like mozzarella and pepperjack. They’re still also free of the top 8 allergens (dairy, gluten, soy, eggs, peanuts, tree nuts, fish & shellfish) meaning that they’re also school friendly. The shreds are also made with 100% non-GMO plant based ingredients. Preheat oven to 400 degrees Fahrenheit and grease your casserole dish. Cook noodles according to package instructions. Drain, and add pasta back to the pan. Drain and rinse your chickpeas and using a fork, mash chickpeas but leave some chickpeas whole. Season with salt & pepper. Meanwhile, melt vegan butter in a medium sized sauce pan and add in your onion. Cook until the onion becomes fragrant and translucent. Add in your minced garlic and flour and cook for 1 minute stirring constantly. Add in your plant milk and mix thoroughly with a whisk and bring to a simmer. Once your plant milk has slightly thickened up, add in your vegan cheese. Still using your whisk, mix until the cheese has melted and become a nice thick cheese sauce. 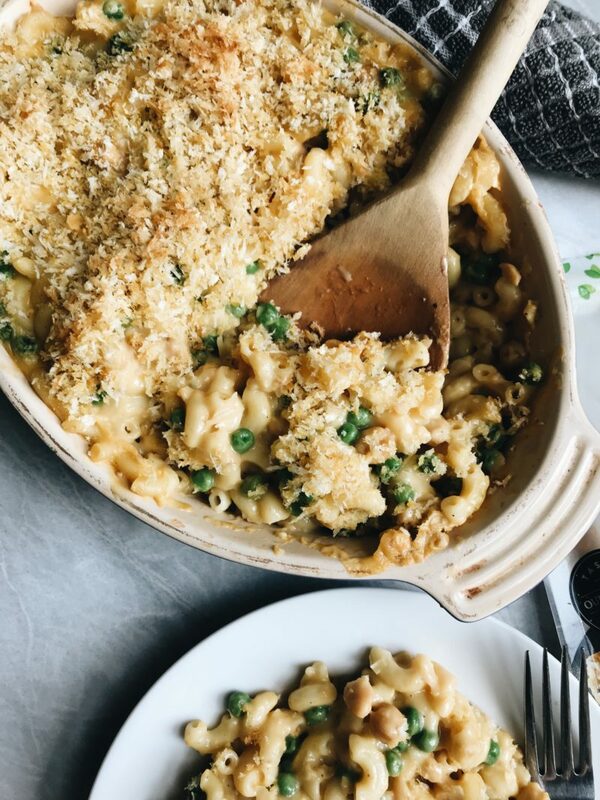 Once your cheese sauce is made, add in your peas and chickpeas and mix to combine. Add your cooked pasta into the sauce and mix to combine making sure all the pasta is coated in your sauce. Add to your casserole dish. In a small bowl combine your panko, nutritional yeast and olive oil and sprinkle all over the top of the casserole. Cook in the oven for 20-25 minutes or until the crumbs have slightly browned. Thank you to Daiya for sponsoring this post. It means a lot to me to work with brands I love and support my blog. I am fairly new to a dairy free lifestyle. Working my way towards vegan lifestyle. I made this tonight in hopes of a quick meal that would fill hungry bellies. The only substitutions I made were using the Daiya Mild Cheddar block vs the Daiya Cutting Board Shreds, Cheddar; and I omitted garlic because I’m allergic. This was a BIG hit at our dinner table. It was fast and tasty! This is a huge deal, I’m a boy mom of 3! Our family of 5 will DEFINITELY be eating this again. Thank you Jane! I am so happy that you enjoyed this recipe, Melody! I love that it was kid approved as well! I am so glad that you enjoyed, Cassi! This was amazing! I was a little nervous while making the cheese sauce but it came together and soooo delicious! I am so glad that you enjoyed, Erica!